Hey friends, today certainly is a happy Fri-Yay! I made quite a few cards and I'll be showing them all to you over the next few days! card blank and card design background. I fixed this to the card blank and set it aside. I coloured the reverse of the flowers with Copics, R35, RV95, Y38, YG67 and fixed them to the card design as shown. Prizes - No blog hop is complete without a prize! WOW! Embossing Powders has 6 powders of your choosing along with a WOW carry case to store your powders in. Whimsy Stamps is giving away a $25 gift certificate to their store. Winners will be chosen at random in the week of 22nd April from the comments left on all the blog posts. To join this giveaway you must leave a comment on each blog post to have a chance at winning a prize! This hop is open internationally! Love both of your cards. Awesome cards! Love the brick design and pretty flowers on your round card! Love the Notched Square Die for your second card, and the Delightful Daisies background stamp! Pretty colors! I love the pastel colors and the shaped card! Just beautiful embossing and card design! Both of your cards are just beautiful. I loved the softness of those pretty vellum florals. But that background was just a knockout. I do not own a lot of WOW embossing powders, but today, I have seen some that I just must own. 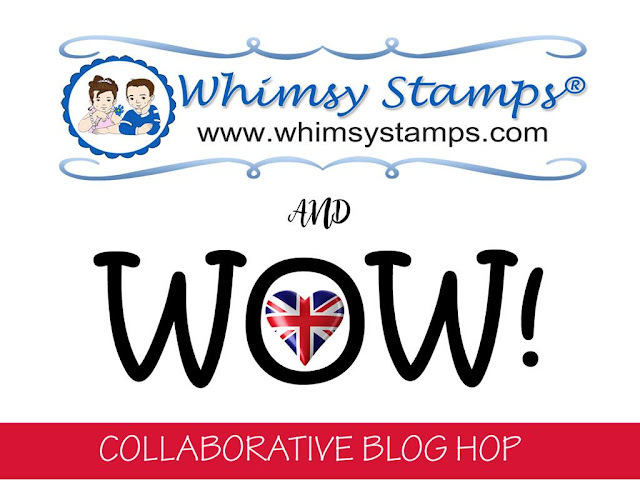 Thank you so much for participating in this fun blog hop. Both of these company’s are awesome! Have a wonderful weekend...I am off to hop along on this fun blog hop. Fantastic creations! All I can say is WOW!!! Love the use of vellum on the first card, gotta try that too! I get the feeling taht I don't use my supplies creative enough, thank you for the inspiration! WOW!! Love both your cards. Love the effect of the Opaque Bright White Embossing Powder on the cards. Really pushed the design out and grabs ya. Nice job. My vellum, you have shown me another updated technique to use it!! Thank you. Such soft pretty colors. Love your cards! Loving the combo of these stamps with these powders! Gorgeous! Great job on these. Love them. I love the flowers on the first card! What a great technique. The second just makes you happy looking at it. Love that you stepped out of the rectangle zone and made them different shapes. Such pretty cards. I particularly love how the white on white bricks create a subtle but fabulous background for your festive florals. Beautiful cards. I love how you colored the flowers in the first card. It is such a fun card. Your second card is just too pretty with the colorful background and the pretty white flowers. Wow! Beautiful cards! Colouring is great!!! Wonderful cards with the embossing. Your colors are so soft and pretty. Nice job.